When it comes to basics, I'm all about investing in pieces I can wear with everything in my closet. 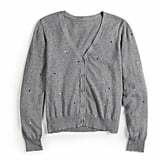 Right now, my current obsession is this Essential Cardigan ($33, originally $44) from the latest POPSUGAR collection at Kohl's. Maybe it was the cute hearts that sold me, but ever since it entered my wardrobe, I can't stop wearing it. I first rocked it with jeans and booties, then flared trousers and heeled mules. But one of my favorite looks was matching it with a silk slip dress and my favorite go-to white sneakers. No matter how I style it, I find myself obsessing over the soft material that's great for layering in cold weather. Plus, with Valentine's Day coming up, the heart details are perfect for date night. If you're looking for a little more color, it also comes in a sweet pink shade ($33, originally $44) with a single heart. 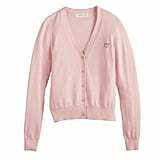 So if you've been on the hunt for the ultimate cardigan, we found it. Keep reading to see all the choices.